It's now official. 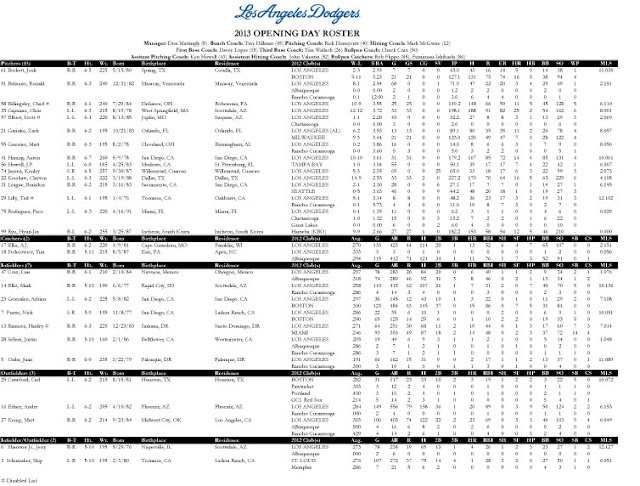 Justin Sellers makes the Opening Day roster, Paco Rodriguez stays in the bullpen after just a year of prefessional ball, and there is no trade movement to speak of (meaning that both Harang and Capuano stay in Dodger Blue). The (Dodgers) placed pitchers Chad Billingsley (right index finger contusion) and Scott Elbert (left elbow surgery) and infielder Hanley Ramirez (right thumb surgery) on the 15-day disabled list, retroactive to March 22. Left-handed pitcher Ted Lilly (left shoulder labrum surgery) has been placed on the 15-day disabled list, retroactive to March 28. 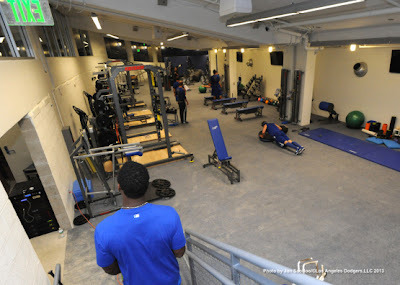 Jon SooHoo shares even more photos featuring the new Dodgers clubhouse area; including the weight room. See more pics here. I can't believe I'm saying this. Larry King has me excited. Too bad I can't make it to Opening Day. Via a tweet by King. Jim Caple at ESPN, "Dodgers-Giants: A Rivalry Renewed." The link also has a great video. The great Maury Wills remembers his first season in the Dodgers organization; it was 1951, the year Bobby Thomson homered off Ralph Branca, the "Shot Heard 'Round the World." He remembers one of the the first fundamentals the Dodgers taught him as a player that year. It was this: He is not supposed to like the Giants. Check out Cole on LA's predictions for 2013. TJ Simers at the LA Times writes poignant piece on how "Vin Scully Prompts Memories of Someone Dear." Via Steve Dilbeck at the LA Times, "Zack Greinke looks more like guy Dodgers signed in 2-1 loss"
Greinke said he didn’t feel any major relief about how his elbow has responded because he wasn’t all that concerned initially. “It wasn’t that bad in the first place,” he said. “Just precautions. GCRL pens a great little biography on Brooklyn Dodger Babe Herman. 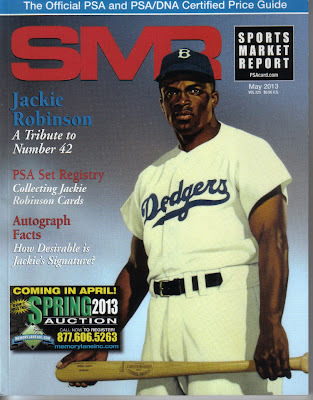 Look who's on the cover of PSA's Sports Market Report. They write several great articles focused on his career and his Baseball cards. - Jackie Robinson: "The Rain of Courage"
- Taking My Hacks: "The Impact of an Icon - More than Just Numbers"
- PSA Set Registry: "Jackie Robinson – An American Inspiration and Hero Amongst Hobbyists"
Are you ready for Opening Day? Well, then here are this Sunday's Dodgers' Videos. Stadium Bound on youtube has been great about posting up videos of the construction work at Dodger Stadium. Walking the Field Level concourse during the first game at Dodger Stadium since the renovations. There's a great view of the field all the way around, with tables and counters to stop at, and no ushers continually saying "You can't stop here." There is also a LOT more room to move and walk. Here are some vintage film reel highlights from the 1955 World Series. This is just a joy: "Dem Bums Warm Up" from 1945 featuring Dodgers' coach Leo Durocher. From the video description. During World War II, soldiers viewed highlight clips like "Dem Bums Warm Up," showing 1945 Brooklyn Dodgers team manager Leo Durocher leading infield practice at baseball Spring Training, before feature films in military motion picture theaters. When Durocher barked out "You haven't got a bucket of paint at third base, you got to get the paintbrush out of your hand," and a narrator coolly commented on Leo's chatter, the sights and sounds of home were within reach for the troops. Dodgers president Stan Kasten and senior VP Janet Marie Smith talk about the improvements made in the last five months to Dodger Stadium. Paco and Sellers Make the Team! We find out that Stephen Fife, Elian Herrera, Alfredo Amezaga, Peyer Moylan, Matt Wallach, Josh Wall, Alex Castellanos and Kevin Gregg have all been either optioned or reassigned. Surprisingly, veteran reliever Kevin Gregg is included. He has been recently touted as in contention for the final relief spot (via Eric Stephen at True Blue LA). Also, Alex Castellanos was favored by many to capture an outfield reserve spot. What we find out by these moves is that Justin Sellers has won a spot in the infield, and will probably be our Opening Day shortstop. Obviously, with Hanley Ramirez going to the DL the team has opted to focus on defense while we wait for the healing to end. Of special note, recent 2012 draftee Paco Rodriguez likely earns a bullpen position as our 3rd left-handed reliever in the pen (assuming Capuano stays a Dodger). 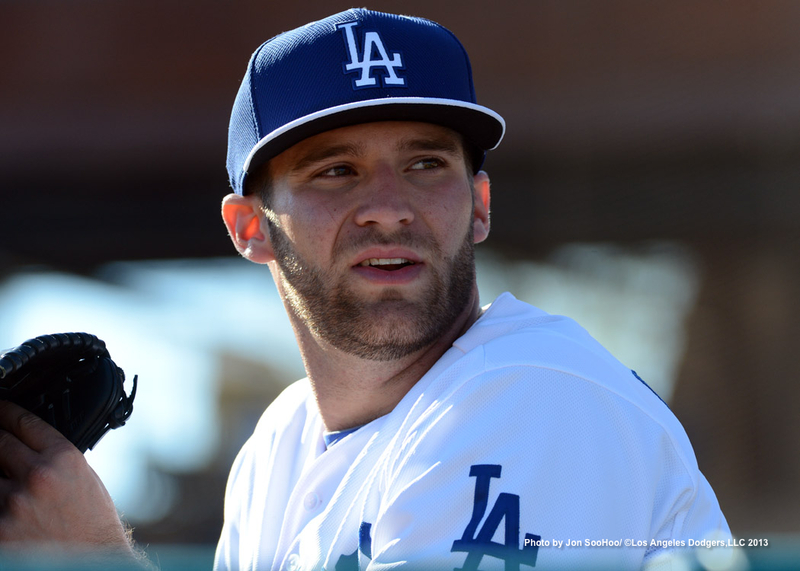 He wowed the team in his 11 Major League appearances during his first year of professional play last year, and continued to impress the Dodgers staff with a great Spring. Carl Crawford, Matt Kemp, Andre Ethier, Jerry Hairston Jr.
John Hoven, at the always great LA Kings blog Mayor's Manor, had a chance to chat with Dodgers GM Ned Colletti the other day. Over the years, Hoven has made many parallels between the Kings and Dodgers, as they both try to rebuild with scouting while adding key parts at the right time. 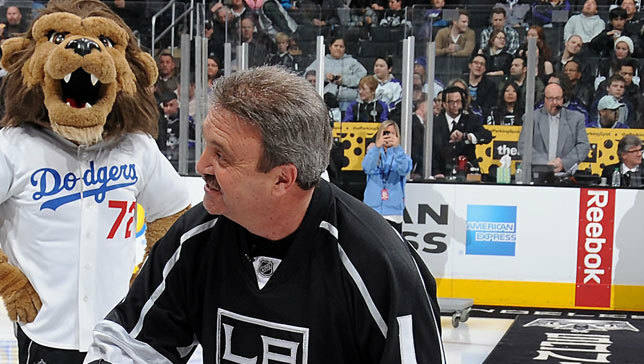 For the Kings they developed Brown, Kopitar, Doughty, Quick and others; while attaining the able hands of established stars like Carter, Richards, Mitchell and Scuderi, on their way to a Stanley Cup Championship. Colletti speaks more about his love of hockey and his connections within the game. He even drew parallels between the work all sports GM's do. The best part of the story, though, is the discussion about Spring Training and the need for young players to leave camp with a lasting impression. And as you can imagine, the topic of Yasiel Puig came up. Colletti shares a scoop that is probably not so unexpected. Awesome! I can't wait to see him at Dodger Stadium. It's going to be a long wait. You should definately check out the entire story. Ned Colletti goes further in depth on how important Spring Training is. 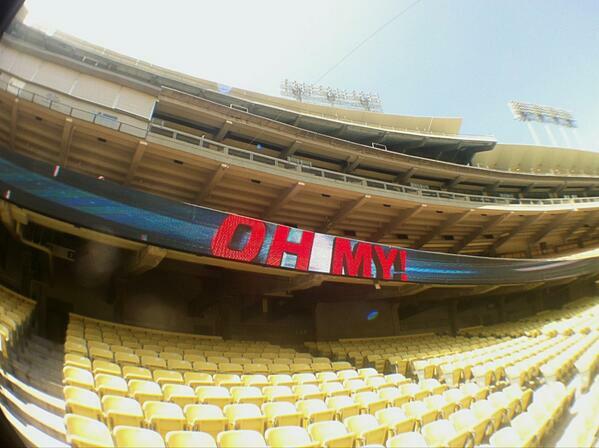 Check out Dodgers' photographer Jon SooHoo's blog for a ton of pics of the Dodger new home right here. Via Eric Stephen at True Blue LA, Chad Billingsley pitched yesterday evening in Arizona in a exhibition game against the Brewers AAA club. He did well, and even threw some curve balls. Is Justin Sellers in the running for the Dodgers' SS job? Mark Saxon at ESPN tells us more. "We still haven't settled anything, but it's just another line of thinking," Mattingly said. Mike Petriello at MSTI says that following up on the recent MLB extension flurry, the Dodgers are set to sign Clayton Kershaw to a $100 Million deal. I really hope this is true. Adrain Gonzalez was impressed with the new clubhouse. Via a tweet yesterday afternoon. Mike Petriello also writes for RotoGraphs and makes 10 bold predictions. Check it out. 10. Juan Uribe will at some point be owned in at least 5% of one of the three main fantasy sites — ESPN, Yahoo, or CBS. 5% is almost nothing, so perhaps you’ve forgotten how awful Uribe is. Sons of Steve Garvey share a fans report card and some photos from last nights game. 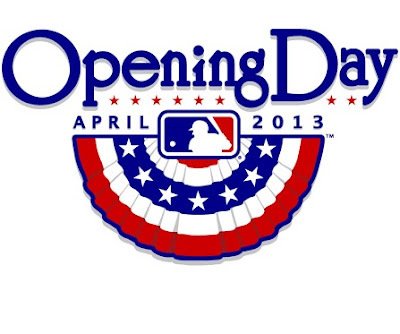 Aaron at Inside Dodger Baseball asks "10 Questions for 2013." What's been the biggest difference for Ryu in his transition from Korea? "In Korea I could get away with a mistake or two, but here I've noticed that when I make a mistake it's a home run," he said. If Charlie Parker Was a Gunslinger... blog shares a great vintage photograph of a closeup of Babe Ruth's batting grip. 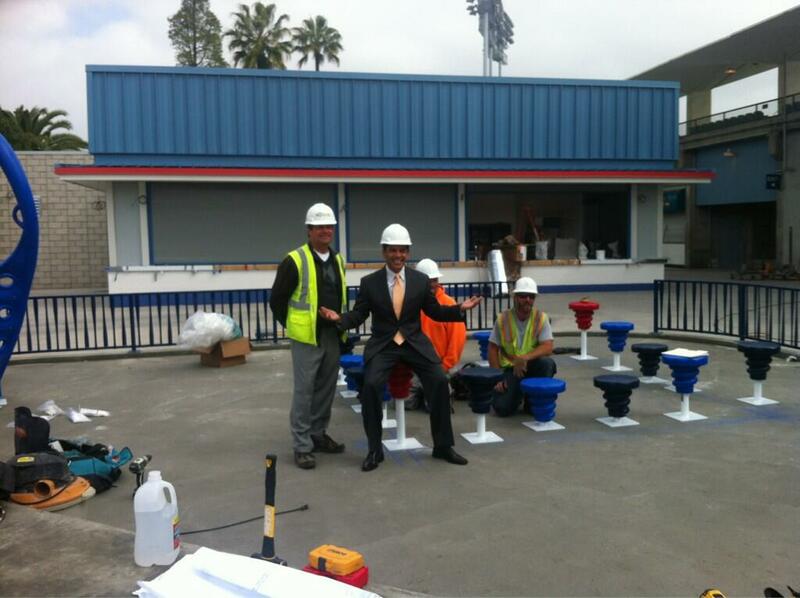 So, What's New at Dodger Stadium? 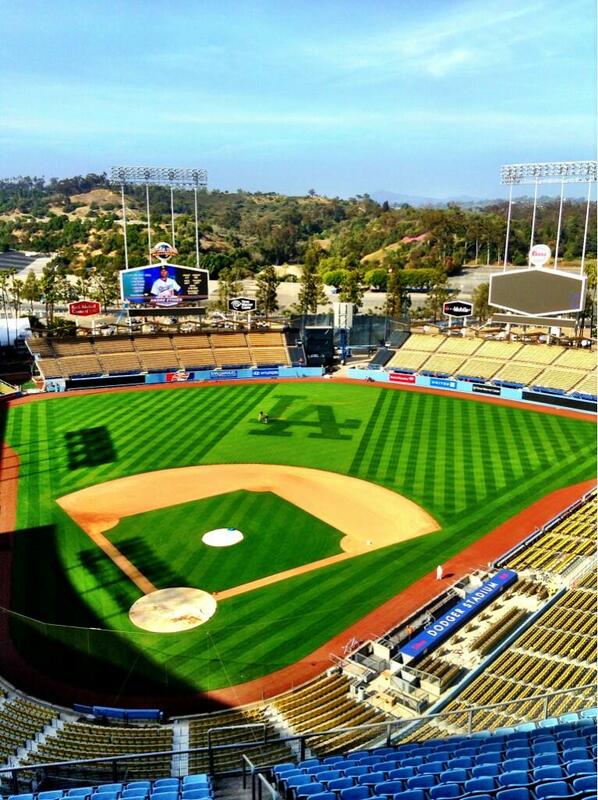 As you know, Dodger Stadium has undergone some changes- some significant changes. All winter long construction crews have been working their tail off to finish before the start of the season, and it appears they are going to hit their mark- save a couple of minor details here and there. Heck, what do you expect for $100 Million? In realty, there was such a short amount of time to get so much done, I'm genuinely surprised they got this far. This really was a monumental undertaking, and the Guggenheim ownership were obviously up for the task. 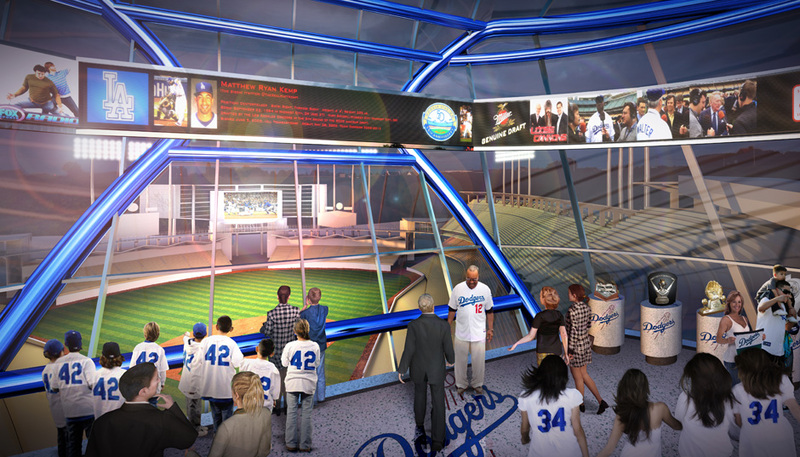 “We have worked extremely hard during the off-season to create the best possible experience for ALL our fans for the 2013 season,” Dodger President and CEO Stan Kasten said. “The upgrades were designed with particular emphasis on the Top Deck and Reserve levels and outfield pavilions that had been essentially untouched since the stadium first opened. Our goal is to provide THE most pleasurable experience from the time fans arrive at the stadium until the time they depart, ideally after a Dodger victory. Kasten makes an important point here. Our old owner (who shall not be named), basically neglected the fans who sit in the cheap seats. All prior improvements during the past regime were geared towards the monied folks. It's as if he wanted to make clear that he could care less about "certain" fans. Anyway, Kasten has reset the table, and makes clear that the rest of us are just as important. BTW, special recognition should go to Janet Marie Smith, Senior VP of Planning and Development, who is the visionary behind these changes. She is known for her work with the Baltimore Orioles (Oriole Park at Camden Yards), Boston Red Sox (Fenway Park) and Atlanta Braves (Turner Field). Expanded concourse area with enhanced views of the downtown skyline. Two new and enlarged concession areas, including new stands, cooking facilities and menus. All new and enlarged restrooms, including a family restroom. New team store with ticket windows attached. 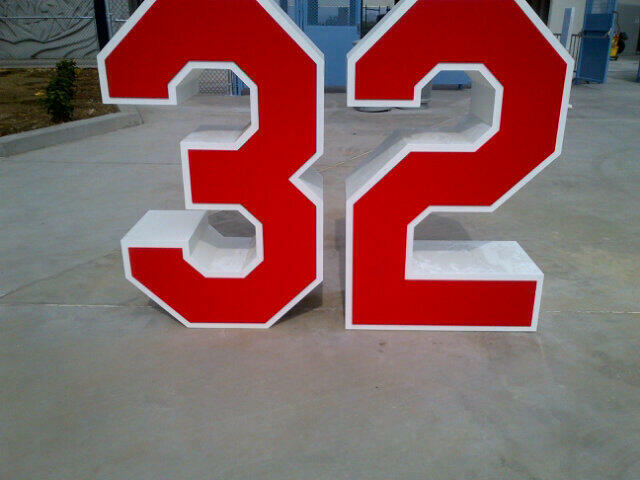 5-feet high “retired number” sculptures. Entry gates extended out 30 feet to enlarge the concourse. 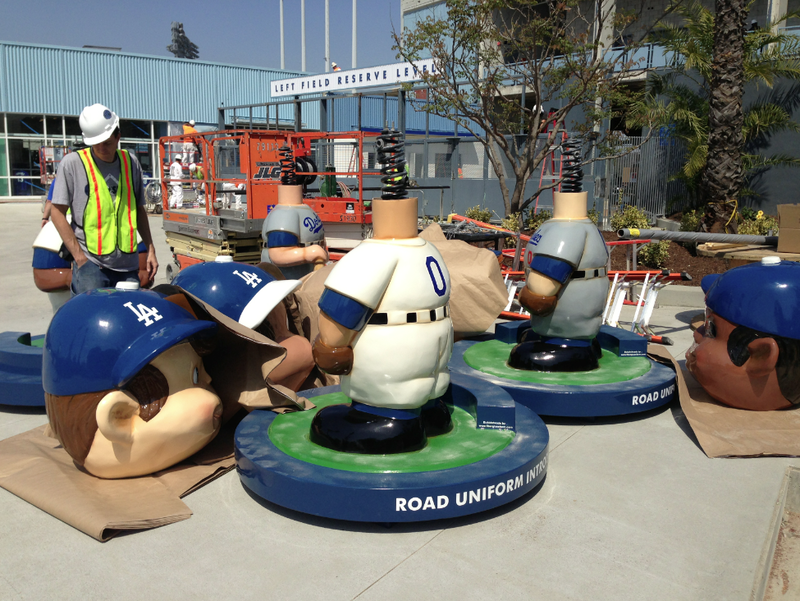 Each gate will feature some special Dodger memorabilia, including oversized baseballs autographed by winners of the Cy Young Award and life-size bobbleheads featuring uniforms worn by the Dodgers through the decades. All restrooms enlarged. Family restrooms added along with water fountains. New concession areas, including new stands, cooking facilities and menus. A team store on the left-field side and another will be completed on the right-field side on a date TBD. Kids play areas on the first-base and third-base side. Expanded concourse allows for more standing room with views of the game and more space for fans in wheelchairs and their companions. All restrooms were enlarged. Family restrooms were added, along with water fountains and a fan service area. Patio boxes for group seating in a casual setting were created at the back of the concourse. Wider concourse and additional locations for wheelchair-bound fans and their companions and standing room with drink rails beyond the foul poles. New entry plazas to create standing room areas with a view of the game. Wider concourse, drink rails and additional locations for wheelchair-bound fans and their companions. 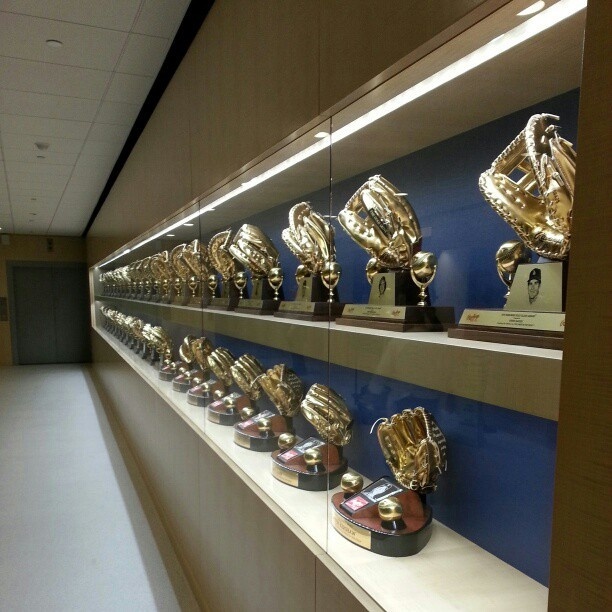 Hallway leading to Dugout Club was repainted and received wood wainscoting treatment with display cases featuring Dodgers Gold Glove, MVP, Cy Young and Rookie of the Year awards. This area is available to all fans on daily guided tours of the stadium. In both left and right field, new and larger restrooms were created more conveniently located under the pavilions. Picnic areas were added. 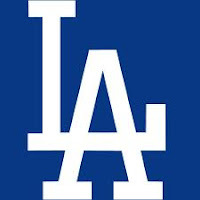 A state-of-the-art Wi-Fi network and cellular antenna system to support cell-phone and internet connectivity from mobile devices will enhance the ability of fans and media covering games at Dodger Stadium to communicate. The project was part of a partnership with Major League Baseball Advanced Media and is expected to be completed in June. An entirely new electrical power grid with seven new substations was added to support these technologies. Entertainment will begin at 12:15 PM and auto and stadium gates open at 10:00 AM. The game against the Giants starts at 1:15 PM. Opening Day pregame highlights will include the unveiling of two new high-definition video boards with a historical look back at Dodger Stadium’s scoreboards leading into “A Whole New Blue” season-launching performance by the Blue Man Group. 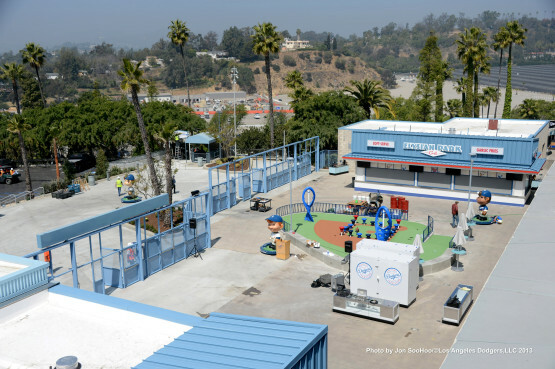 Dixieland and Mariachi bands located in new plaza areas throughout the ballpark will provide live entertainment for fans entering Dodger Stadium gates. A pregame recognition of the Dodgers’ 1963 and 1988 Championship seasons is planned, with this season marking the 50th and 25th anniversaries respectively of each milestone. A special Opening Day video chronicling the journey of the Opening Day first-pitch baseball will feature notable Los Angeles athletes and celebrities. 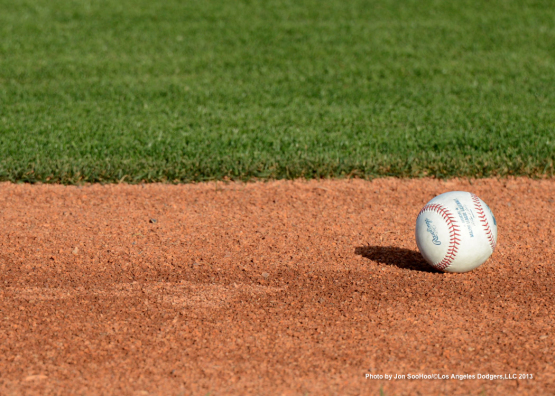 The first pitch baseball’s journey will conclude with the ceremonial first pitch at Dodger Stadium. The United States Marine Corps Mounted Color Guard stationed at the Marine Corps Logistics Base in Barstow will present our nation’s colors riding on Palomino-colored wild mustangs from the Bureau of Land Management’s Adopt –A- Horse program. One hundred fifty uniformed personnel from the Army, Navy, Marine Corps, Air Force and Coast Guard will unfurl a giant flag on the field during the national anthem. All fans seated in the Right and Left Field Pavilions will participate in an interactive card stunt during the game, a first for Dodger Stadium. This can be a rowdy bunch, so I hope this works out. The Dodgers will pay tribute to the men and women of our nation’s Armed Forces by honoring a “Veteran of the Game.” Opening Day’s veteran of the game is United States Marines Corps Corporal Fernando Salazar of Monterey Park. Salazar joined the Marine Corps in 2000 and served as a machine gun squad leader with Alpha Company, 4th Battalion, 4th Marines during Operation Enduring Freedom and RCT I, the first group to enter Iraq for which he was awarded the Navy Achievement medal with a Combat V for Valor, which can only be issued during a time of war. New to Dodger Stadium concessions are LA Taqueria (Reserve Level) and Elysian Park Grill (Two locations on Reserve level and Top of Park). LA Taqueria will offer items including Fish Tacos and Street Style Carne Asada and Pork Carnitas Tacos. 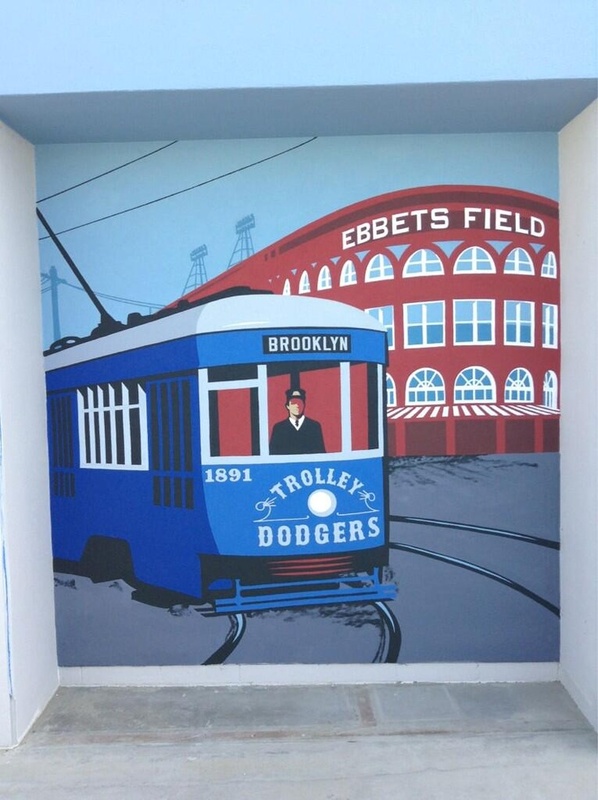 Elysian Park Grill will offer a Dodger Blue Heaven Burger, Kids Grilled Cheese, Santa Fe Turkey Burger and the new Brooklyn Dodger Dog, an east coast take on the classic Dodger Dog. Loaded Dog Concessions are back with several new options and vegetarian-friendly items include the Veggie Dog. Soft serve, garlic fries, kid-friendly items and ICEE will be available on the Reserve, Top Deck levels and throughout the stadium. More than 30 items are priced at $6 or less. Official Team Merchandise Stores locations - left and right field tent stores, Top of the Park and Reserve - will now open 2 hours prior to game time. The Reserve level third base side store has been enhanced extensively and will offer merchandise for all ages. 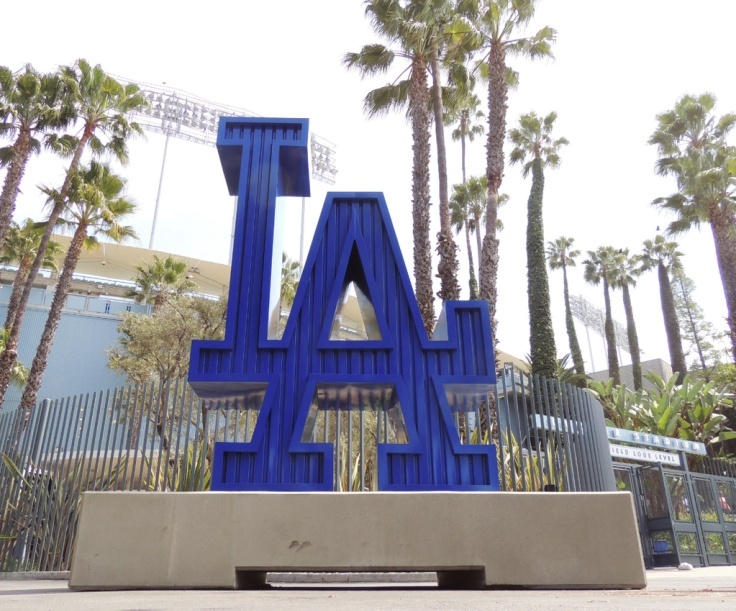 There are several season-long in-store promotions that make Dodger Stadium the most affordable retail location to purchase Dodger merchandise. For the first time, there will be several carts that will assist in transporting the disabled, seniors and families with young children from the parking lots to the ticket gates. There will also be gate greeters to assist fans with questions as they enter stadium gates in addition to ambassadors at parking gate entrances. 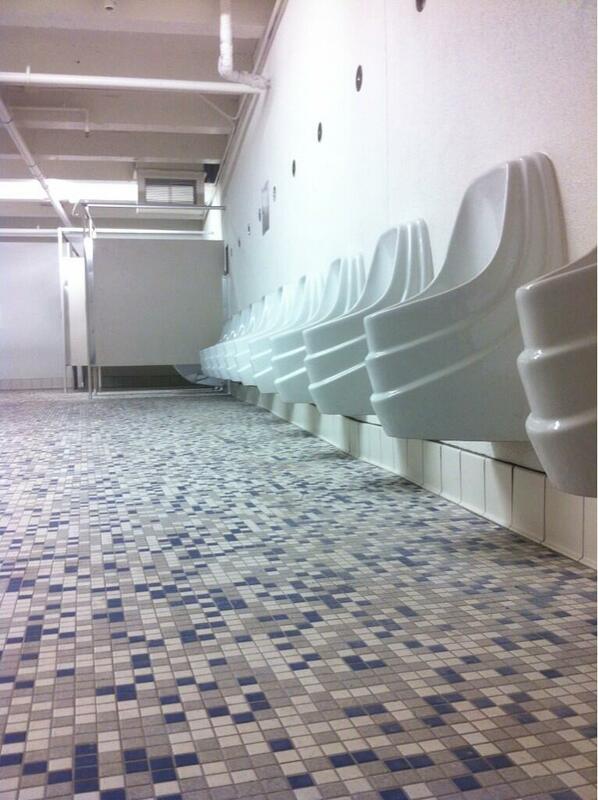 Additionally, family restrooms have been added and there are now dedicated fan service locations throughout the stadium. As I've written numerous times before, I can't stop enjoying the artistic works of Willard Mullin. 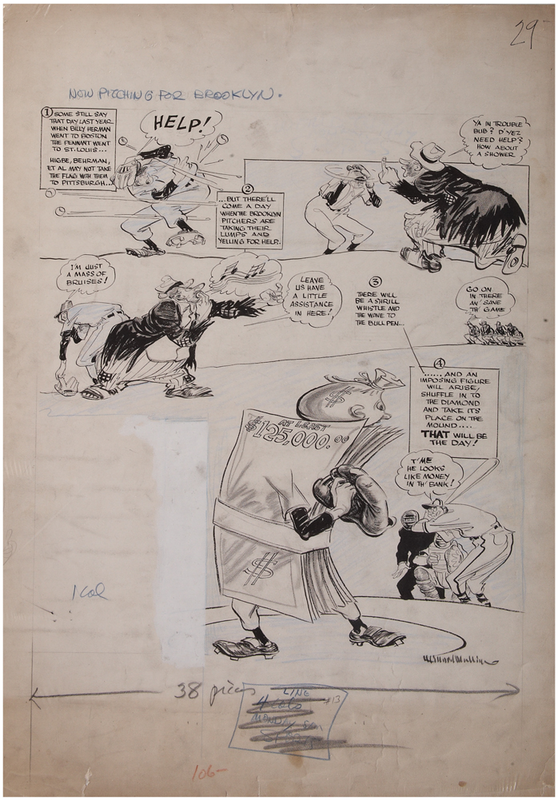 As you probably know, he was the sports editorial cartoonist who created the "Brooklyn Bum". 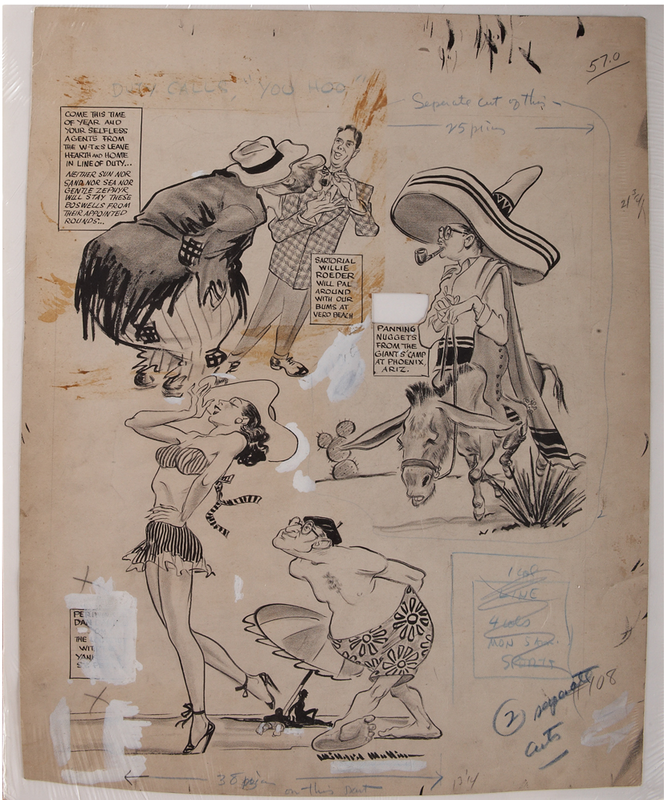 Currently, a couple of his original drawings are available for auction at Goodwin & Co., and I knew I had to share them with you in this post. BTW, click on any pic to embiggen. Below is an undated drawing that has been titled, "Now Pitching for Brooklyn," but based on the subject matter it is likely from mid-1947 or a little later. As you'll see, it laments the loss of the pennant to St. Louis in 1946 - noting that some argue that the trade of Billy Herman to the Boston Braves handed the pennant to the Cardinals (they eventually won the World Series). Later on, it addresses the mid-1947 trades of pitchers Kirbe Higbe and Hank Behrman to Pittsburgh as unwise. After all, sending those pitchers away can only come back and bite us in the rear. In the end, Mullin suggest that there maybe a secret high-priced ace (the Dodgers received $100k in the trade with Pittsburgh) coming to the Dodgers, but screams out, "that will be the day!" As we know today, the trades made at that time are closely related to the promotion of Jackie Robinson. The team felt it necessary to rid the team of certain "southern" influences (to put it lightly) in hopes of making Jackie's transition to the team a little bit less taxing. After all, it's bad enough that the opposition has it out for you, but your own teammates? Well, Durocher, Rickey and O'Malley found a solution - ship them out of Brooklyn. This next drawing is titled, "Duty Calls, 'Yoo Hoo'," and I don't quite get it. Let me know if you have any idea what this drawing is all about. At least the drawings are funny. It is undated. 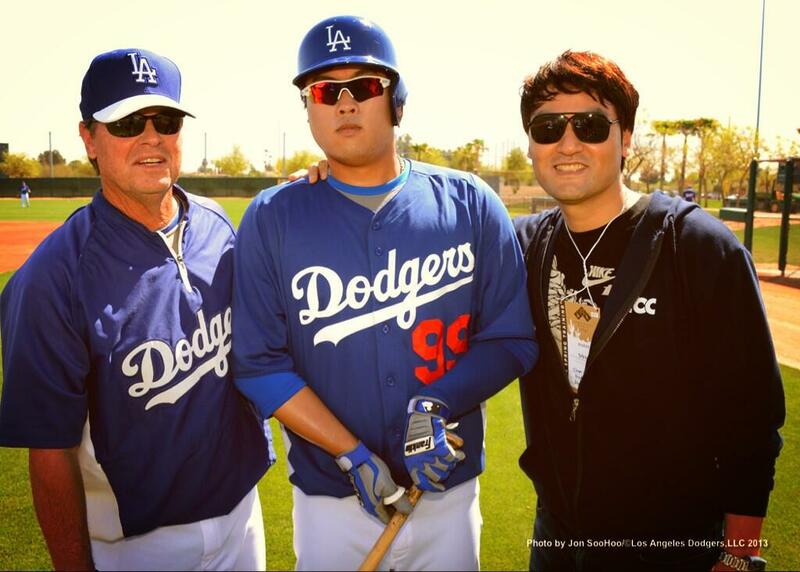 Here's a great pic of Rick Honeycutt, Hyun-Jin Ryu and Chan Ho Park as tweeted by Ryu. Photo credit: Jon SooHoo/LA Dodgers 2013. Check out a bunch of photos from the RC Quakes/Dodgers game yesterday from the Quakes, here. Mark Saxon at ESPN wonders if Carl Crawford's arm is actually better than before surgery. Hey, it works for pitchers, right? Via Ken Gurnick at MLB.com, "Kershaw Already Impressing Fellow Ace Greinke." "I haven't seen that much, but his fastball is special," Greinke said. "His fastball, hitters have to cheat for it. If they sit on another pitch, they won't be able to hit the fastball. That's important to get strikeouts. You can't sit on the offspeed and fight off that fastball. He just has an ability that's huge. Then he's got the nasty slider. No way a hitter can legitimately be on both of them. That's how he strikes out over 200. "You can't steal off him. He's got endurance. He's a workhorse. So, to me, he's pretty much the complete pitcher. I don't know how good his command is compared to me or someone else because I haven't seen him enough. But his stuff, you could actually tell a guy what's coming and it might not matter. Hyun-Jin Ryu finished Spring Training with 4 shut out innings against the Angels yesterday, via Austin Laymance at MLB.com. "All my pitches are pretty up to normal now, I feel comfortable," Ryu said. "I feel the same way before the Korean season starts." Dodgers manager Don Mattingly likes what he's seen so far from the southpaw. "He's thrown the ball great all camp," Mattingly said. "Obviously coming in, we have no idea what to expect other than seeing him on tape and knowing he was the best pitcher in Korea. I think he's shown that he can pitch at this level, at least during Spring Training he has. The season can be a different scenario." 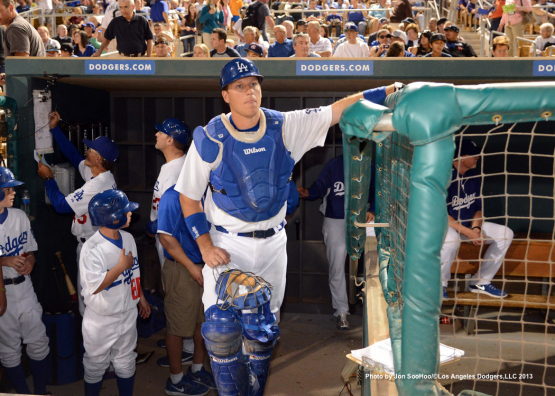 Dustin Nosler at Feelin' Kinda Blue takes a look at the best gloves in the Dodgers' farm system. Mars, baby! Over at the Huffington Post they let us know of some incredibly detailed HD quality views of our sister planet. Check it out. Fox Sports provides some highlights of Manny Ramirez's first game in China; including a video of his at-bats. Coming back to Dodger Stadium, to the cheers of the environmentally minded and driving averse public, is Dodger Stadium Express. Go to the LA Metro home for details. BTW, in hopes of not confusing you, the bus line will start tomorrow, Friday, for the Dodgers/Angels Freeway Series. 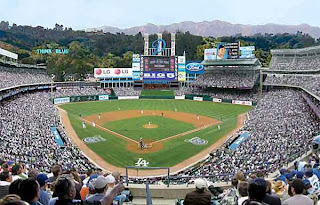 In anticipation of the Grand Re-Opening of Dodger Stadium, I though it would be fun (if not interesting) to take a brief look at what the Dodgers home could have looked like. Thanks to a recent post on reddit I was reminded of Hershiser's bid to buy the team and his grand plan to remake Dodger Stadium into a technological playground. As I'm sure you'll be saying to yourself soon, thank goodness the Guggenheim folks bought the team because this vision would have made us all blind. commissioned to design a new state-of-the art upgraded version of the stadium, complete with an iconic electronic big screen TV. 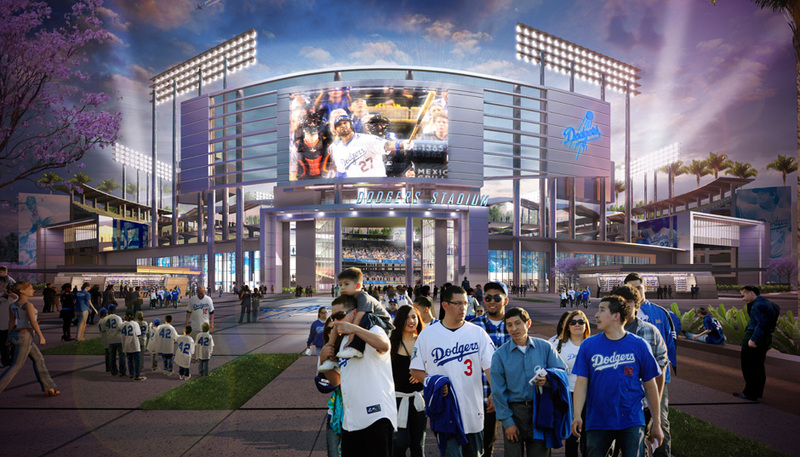 The new design includes the addition of double-deck seating above the right field, structure parking near the field, a grand accessible walkway circling the stadium, a new restaurant, as well as cultural, themed, and entertainment venues. Clearly, he was absolutely right about trying to appeal to a new world filled with new media, technology and instant communication, but wrong on implementation. 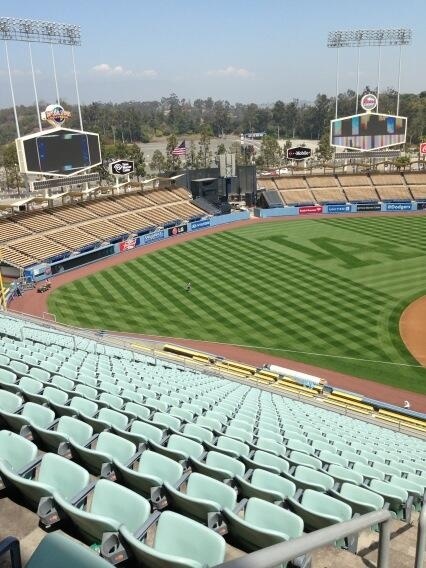 I think the recent photos shared by the current Dodgers ownership of the renovations tells us that they are taking those steps in the right direction. 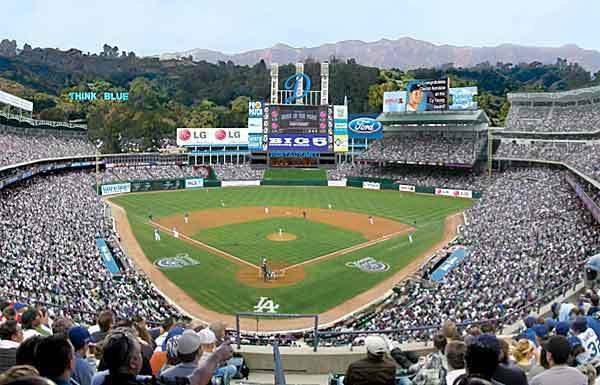 They are focused on the beauty and majesty that is Dodger Stadium while making necessary improvement in aesthetics and amenities. 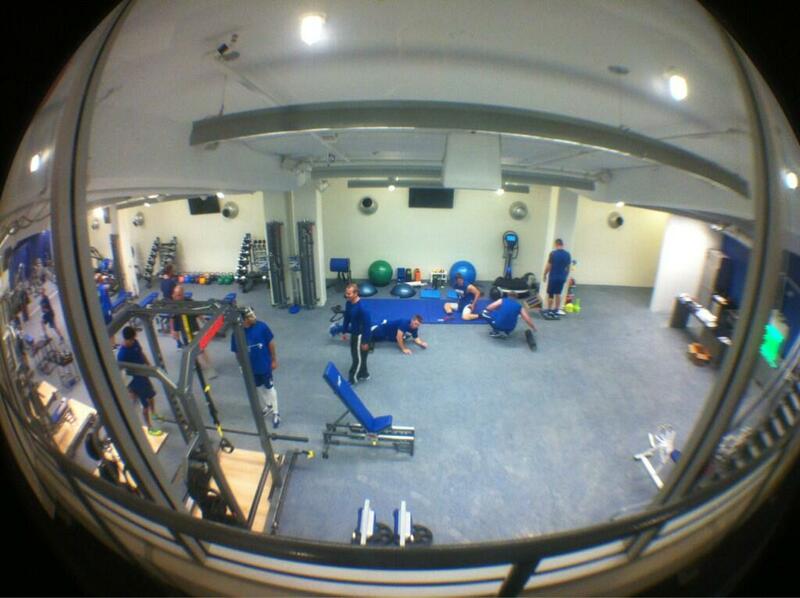 Check out some of those photos below that the @Dodgers tweeted. It's not often that a vintage photo featuring no professional ballplayers gets so much attention. In fact, it's just an old 1860's era photograph on cardboard backing (commonly referred to as a CDV or carte de viste) of a group of school children enjoying the growing game of Base Ball during school recess. Check out the photo above, as well as a blown-up image of just the kids playing ball below. Also, you can view the original auction here. This single 2.5" x 4" photo sold at $3,800.00. Why so much, you ask? Well, first of all action photos of the game on CDV form or dated from the 1860's or older are extremely rare. Like, super rare!... You just don't see them. The photographic arts was so new back then, they had yet to really figure out action shots. Granted, considering the placement of the kids on the field (being that they are so close together) you might argue that this was posed for the photographer. Still, it's a rare image that clearly shows the game. Furthermore, other like-kind photos from the era usually only show Baseball in the background rather than as the main focus of the photo. For instance, a 1862 photograph at Fort Pulaski in Georgia shows soldiers standing in formation while other soldiers are seen playing Base Ball in the background (see that here). Clearly, this photo is just about some kids playing the game. Additionally, this very same image was specifically featuring in Ken Burns' Baseball documentary. It can even be found in the companion Baseball documentary book (page 60). See it below. So, this photo is iconic and a rarity in the hobby. A version of the print was also featured in the most important film/documentary to ever record the history of the game. And, any monied collector interested in the the game's past probably placed a bid. All I want to know is what the heck are those two kids standing on 2nd and 3rd base doing? They both have their arms way above their heads in anticipation of a pitch to the batter. What the heck? Hat Tip: Leon at the Net54 Message Board. So... Can I take one of these home? Above is a pic tweeted by the @Dodgers of one of the giant bobbleheads that have been installed at Dodger Stadium. Can you say Conan O'Brien? Is it too early to say that Dodger Thoughts is back? Jon Weisman pens a great piece focused on the often unappreciated greatness of Burt Hooton. Lyle Spencer at MLB.com tells us that Chan Ho Park believes in Ryu's skills. "Wait until May, June," said Park, who was a big brother figure for Ryu in 2012 on the staff of the Hanwha Eagles of South Korea and has been in the Dodgers' camp late this spring. "He's going to get better. That's how he is. He gets stronger and sharper as the season goes on. As long as he stays comfortable, he'll be fine." Vincent Bonsignore at the Daily News writes a great piece on the rise of Luis Cruz. "I was hungry to be in the big leagues and I knew I could play here. I just never had a real chance to play," Cruz said. "But you just keep waiting and waiting for that chance and then try to take advantage of it when it comes." 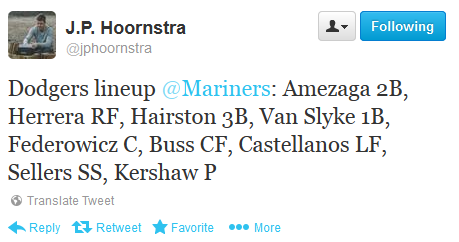 Dustin Nosler at Feelin' Kinda Blue lets us know that both Billingsley and Lilly are likely to start season on the DL. You should check this out if you're artistically inclined. Via the Baseball Hall of Fame, the US Mint will have a coin design competition for a 2014 National Baseball Hall of Fame Coin that will be made. Jeff Sullivan at FanGraphs explores the consequences of the new balk rule. MLB and the Players Union recently released PED test results going back to the start of the 2011 season to the end of the 2012 playoffs. See the press release here. A total of 5,136 samples -- 3,955 urine tests and 1,181 blood tests -- were collected and analyzed during the time period. Eighteen of the results were positive and resulted in discipline. Seven were for performance-enhancing substances, including four for testosterone and one each for Clenbuterol, Clostebol and Tamoxifen. Eleven were for stimulants, 10 for Adderall and one for d-amphetamine. There were 119 Therapeutic Use Exemptions granted for Attention Deficit Disorder (116), Hypertension (2) and Hypogonadism (1). As you probably know, the LA Kings visited the White House the other day in honor of their Stanley Cup victory last season. Go to the LA Kings Insider official team blog to see some photos from their visit. As one of the more powerful persons in Los Angeles, Mayor Villaraigosa did the only thing a reasonable man in his position would do. 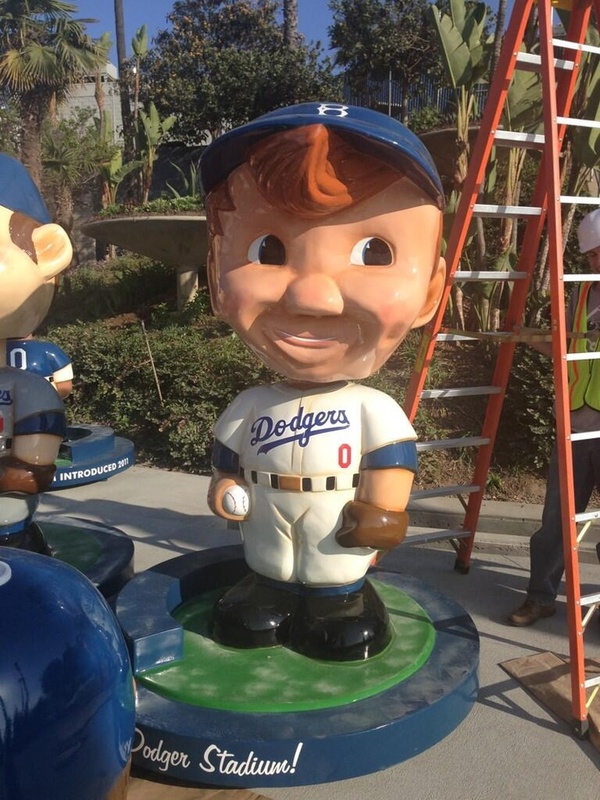 He tested out the plunger looking things in the new Dodgers' children's playground. See the pic below tweeted by the Dodgers below as proof. 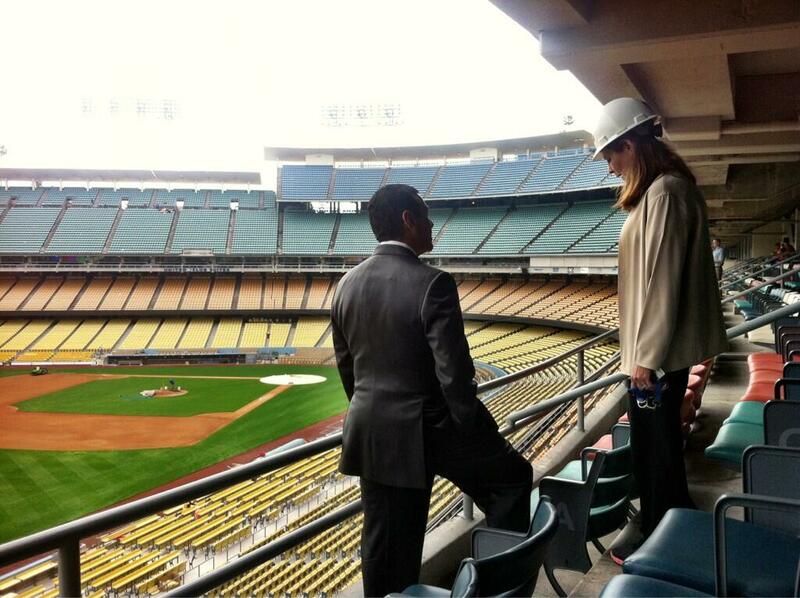 As you probably guessed, the Mayor received a personalized tour of Dodger Stadium today from Janet Marie Smith. 10,557 watched the Dodgers wrap up their home slate at Camelback Ranch last night, finishing with an attendance mark of 133,460 in 17 home dates (average 7,851, including the Mexico exhibition). That is the Dodgers’ second-highest home attendance mark in team history behind only the 136,944 that the club drew in 15 home dates in 2009 (average 9,130), which also included a World Baseball Classic exhibition. Los Angeles also established a single-game Cactus League attendance mark with a sellout of 13,721 on Saturday night against the White Sox, giving the club the top three highest attended games in league history. Los Angeles ranks second among all National League squads with a .348 on-base percentage and ties for second with 102 walks. Once on base, the Dodgers have been active on the basepaths, leading the NL with 36 steals. On the mound, Dodger pitchers have struck out a Major League-best 259 batters. Among MLB starters during the course of his career, Kershaw also ranks 10th in winning percentage (.622, 61-37), places third in strikeouts per 9.0 innings (9.29) and has allowed the second-fewest home runs per 9.0 innings (0.59). Today will be Kershaw’s seventh start of the spring after last pitching on Friday against the Reds, allowing three runs (two earned) on four hits in 6.0 innings. Kershaw struck out a spring-high eight batters in that outing and has fanned 28 in 25.0 innings. Following Kershaw for the opening series against the Giants will be LHP Hyun-Jin Ryu (April 2) and RHP Josh Beckett (April 3). Ethier, who is hitting .348 with a .423 on-base percentage, is tied for the National League lead with three triples this spring. Of his 16 hits, 10 have gone for extra bases (six doubles, three triples and a homer). 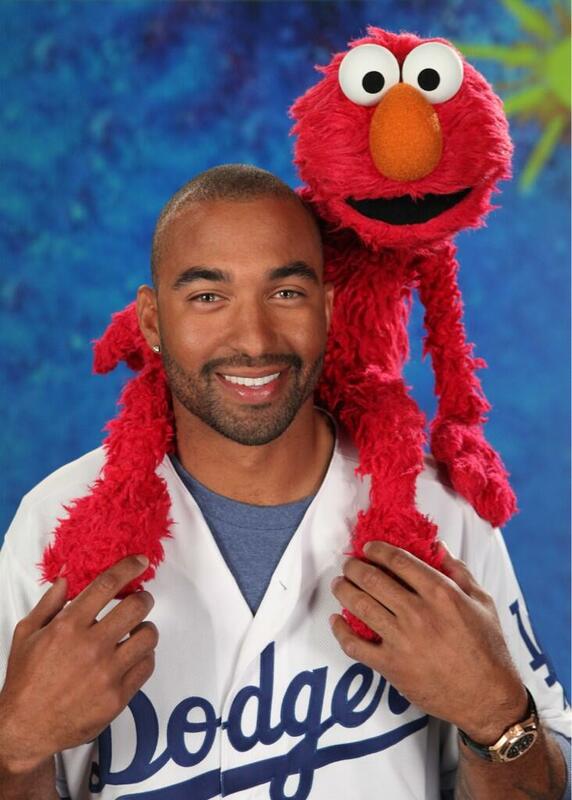 Here's a fantastic photo featuring Matt Kemp with Elmo, provided through twitter @Dodgers. Check out a preview of his appearance on Sesame Street right here. Roberto at Vin Scully is My Homeboy shares a great post about meeting former Dodger and current LA area Pastor, Solly Drake. Reporters sure do love harping on Andre Ethier. If it's not one thing, it's another. Here, Steve Dilbeck at the LA Times wonders if a happy Andre is actually a bad thing. Now normally this little piece of baseball nirvana is a desired destination, but we’re talking about Andre Ethier, a man who believes he’s built a career constantly facing down naysayers. It’s a motivational tool used his entire career. He’s admitted that chip on his shoulder provided focus and determination, fueled his ascent as a major leaguer. You know, to that career not a single soul on planet Earth believed he would ever achieve. Dylan Hernandez at the LA Times makes note of some important details on Yasiel Puig's contract that the Dodgers probably considered. Once Puig has enough service time to have become arbitration-eligible had he not signed this particular deal, he can void the contract. That doesn't make Puig a free agent, but it allows him to have his salary determined by arbitration. Don Mattingly compares Puig to a Ferrari, via Eric Stephen at True Blue LA. 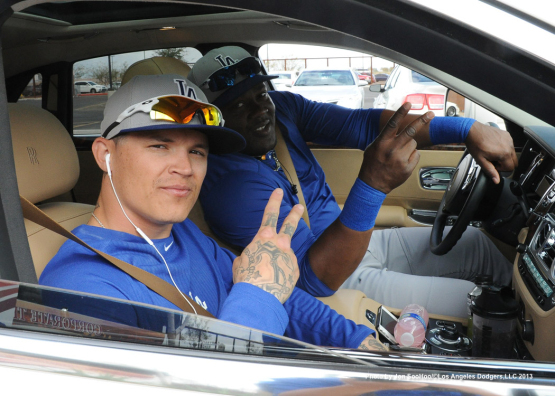 "I told Ned (Colletti, general manager) this, I look at Yasiel like a Ferrari. The motor is there, the body is there, the wheels are there, but you just haven't painted it yet. Then you leave it out in the sun with no paint and you get it exposed a little bit," Mattingly said. "We want this guy totally ready as possible when he walks in the door at Dodger Stadium, and not to ever have to go back down again." Via Korea Joongang Daily, we find out that Hyun-Jin Ryu will start Game #2 of the season. “I thought it’d be fine starting the fourth game. I feel a bit of pressure starting the second, as the opposing team will send out a good pitcher,” Ryu said, according to Sports Hankook. In the game against the Giants, Ryu is expected to face off against Madison Bumgarner, who went 16-11 last year. Bumgarner, 23, won the second World Series game last year, shutting out the Detroit Tigers over seven innings. Ryu says he’s up to the challenge, however. “When I was in Korea, I thought I’d like to strike out San Francisco catcher Buster Posey,” Ryu said. Left Field Pavilion does it again. Check out his version of a Sports Illustrated cover they didn't make, but should've. Max Weinstein at Beyond the Boxscore shares his preview of the 2013 Dodgers. Tom Bartsch at Sports Collectors Digest lets us know that MLB Historian John Thorn is a collector and a huge Dodger fan. “I fell in love with the cards before I fell in love with the game because they’re these cardboard gods, these iconic bits of America that for me as an immigrant boy, were visas that I could have stamped and would let me into places that otherwise I thought I might not get into,” he said. In my opinion, the country version of this Keisa song, Die Young, is better than her auto-tuned version. Here is the country adaptation by Scott Bradlee.